Great but not that good. Fascinating start. Fascinating but not carry-me-high triumphantly- not even for the French, I suspect. Fascinating with some real drama (Italian tries/Parisian palpitations) but I wonder if the Irish may be most encouraged by events in the opening two games of #6nations 2014. Because Wales were in a game, a match, rather than in processing to victory mode and because the other fancied side, England, were utterly mixed. So a flurry of emotions as Wales threaten, then are held in check by a surprisingly durable Italian effort and England stretch from the shocking to the fluent. A beginning loaded heavy with that full spectrum of error and mischance and with as many flukes as joys – which may be standard, on reflection. Perhaps this ‘great stuff’ works in terms of the best-value build towards maximum, arse-quaking tension. It certainly helps out re the option for recourse to @WelshDaliLama’s now annual bingerama – relief being offered via our enlightened friend in the form of… well, alcohol. Wales got their win and Gatland will be okay, you suspect, with the fact that Italy come out of the opening game with most credit. He might believe, with some justification, that the visitors were always likely to expend a disproportionately huge amount of their budget of #6Nations energy on this fixture. They probably did but this should not in any way deflect from another step up from the Azurri. They brought their usual passion but have built something more concrete now – a game that has a certain purpose and shape to it all round the pitch. Sure they still lack both the consistent killer instinct and the all-round kicking game of a top level side but let’s hope their achievements include more regular wins against those sides currently nearest to them – Scotland and.. whoever. Good for the tournament, methinks if the Italian effort can be sustained? Positives for Wales included signs that Jamie Roberts may be influential again, following a longish period where injury plainly undermined him. He made a simple try for his centre partner through composed, direct running and was persistently, reliably available, engineering or maybe bulldozing into space in the manner of old. However despite the various weapons available to Priestland, there was never the sense that a rout was likely to be orchestrated by him or anyone else. The Wales pivot again neither emphatically confirmed himself nor gifted the job to Biggar. Perhaps this was why the Welsh performance proved acceptable rather than exceptional. But look, pundits having gone over the Gatland-as-one-trick-pony thing endlessly, let me offer a view on this. It strikes me that Wales have such broad skills as individuals, such quality when at full strength, that this notion that they are essentially bish-bosh is a tad cheap. Yes you might argue that (for example) Halfpenny rarely comes into the line (and that smacks of caution) but hang on there. With two genuinely deadly wingers combining power, pace and dodge-ability, plus Roberts and ideally a certain J Davies at centre, it’s surely ludicrous to consider Wales one-dimensional. 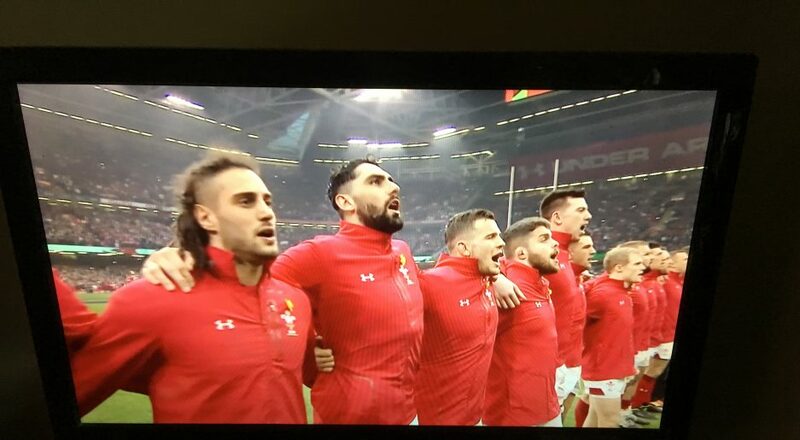 It might be true that the former tri-nations outfits may smother – may have smothered – Welsh aspirations in recent years but their pattern of play tends to be more of a springboard than a straight-jacket. It’s simply harder to get things to work against the very best. Gatland has more guile and wit than many give him credit for. And Wales deserve to be favourites in this tournament despite the uniqueness of the burden – or hat-trick challenge – ahead of them. But back to the booze. Stuart Lancaster and his extensive backroom staff may have needed a tipple after their cruel defeat. Midway through the second half, with the opposition looking both jaded and a tad downhearted, a ten point plus win seemed likely for England. France had the better of the first half, without ever seeming fully joined up, but around 50 minutes it appeared the relentless work of Lawes and Launchbury in particular had sucked the life of the home side. I don’t often write that England were cruising with some style but that was almost where we were at. Again this was predicated on top-drawer stuff from the forwards – more in the loose than at the set-piece, arguably – as Vunipola B roared around the park and Robshaw C got quietly on with his usual, intelligent patrolling, covering, presenting. The machine was purring with only the occasional turnover to disturb the serenity of its progress. It didn’t matter. Or rather at least it was unsuccessful. Or at least – they lost. Meaning that however you dress it up, England’s purplish patch was (yes) encouraging but insufficiently decisive; they (in their own terminology) failed to execute… enough. Throughout the game, France lived off scraps. Even in a first 40 that they conspired to dominate, Les Bleus still had the look of a side thrown together – again. The halfbacks continued in the historic, less than convincing vein, their interventions neither demonstrably positive nor particularly polished. In midfield, the match was a mess, for both sides. Only at the breakdown, where Nyanga scrambled ravenously, or through English error, did the game come back to France. In other words, this game was so-o there for the taking. At half-time, despite a small deficit, Lancaster would have been rightly optimistic that the precious away win to start was entirely achievable and this likelihood turned to a racing certainty as England utterly outplayed France for much of the second period. It may be churlish to mention that the cataclysmically inept opening thirty seconds were in fact critical but inevitably they impacted – on the board and in the mind. A bog-standard claim was so misjudged by a quaking coterie of Englishmen that a French try resulted only a handful of seconds later. Do the math. Five points were conceded and more. Nowell – Lancaster’s most significant gamble, perhaps? – was, unfortunately right in the midst of this horror show and despite frankly bewildering figures later issued by England Rugby suggesting the young winger carried well, he went on to have the marest of all mares, poor love. Caught in possession, at fault for or culpable for more than one try… my god it was painful to watch. He might have been removed, with a carefully issued consoling word, at the half. So England were nearly good but sometimes dreadfully error-prone. And Wales were… okay. Short of an incredible injection of wit, discipline and consistency, Lancaster’s aspirations for World Cup Leading Contendership seem a long, long way off to me. Despite that famous England win over the All Blacks and their own alleged obviousness, Wales remain closest to the main men. In this World Cup of the North, only the Irishmen can get to them. What I did in my holidays, by bowlingatvinny, aged 624. Travel. Culture. National ‘type’ or character or that thing about how a place feels. Rich but loaded territory. I stumble over it here and waft airily through memories following a break in France and Spain, foolishly crossing over into stuff which we may have to label judgement; knowing it’s not just ludicrous but probably downright wrong to make comparisons between places. It is, however, bloody tempting to try to capture some sense of what was wonderful – what we loved most. Hey look I’m still cruising down the slope back into the Valley of the Working. Having recently nosed through the Vallée d’Aspe and then gawped at the Pyrenees from both sides, I remain 70-30 (percentage-wise) in the grip of Post Hols Daze-Virus Effort. And I have no raging urge to deny the affliction by deigning to re-enter normal life. Why should I, when so recently we were on Penä Oroel in the balmy heat watching some Aragonese bloke launch a paraglider? Into thermals us West-Walians would poetically-enthusiastically describe as liftin’ with vultures, mun? Why would the everyday exclude or even intrude on that? No, let’s loiter in that memory, please, have tâpas with it and drain the slowest of slow coffees. Until finally we click over into school pick-ups and yaknow, rain. Yup we went from Wales to France and Spain, flying Stansted-Biarritz and picking up a car to skirt, drift and boot through the mountains to Jaca, Aragon. Critically, we could stay with friends in a tiny hamlet where climbers wipe before entering Los Pirineos; both on a financial level and in terms of accessing local cultural/geographical highlights this helped. In fact it simply made it possible. Emerging from the likeably tiddly airport at Biarritz, more than faintly disoriented by the cack-handed Megane somebody foolishly hired me, we GET AWAY remarkably. Admittedly I’m looking for the wrong mirror/wrong life-endangering juggernaut but we are unmistakably away and into the drive – into our holiday. We see some French roads – some Basque roads – and trees and villages. We look at the strangely conflicted words on the signs and fail (consistently) to say half of them. Whilst not quite meandering we draw in some of the local stuff – sweetcorn, mainly – and the colour red and the colour white. And tiles. Then poplars being sentries but maybe the sort that welcome rather than guard. We get in to that French Basque zone, gently… but sure… like tourists. Wondering how San Sebastian can be the same place as Donostia summink-or-other? Maybe searching for some dubious link between Basque and Welsh but ultimately leaving that one be. And just looking. The flight had been okay. Ryan Air. Meaning a slightly edgy mob of wannabe guitar players, surfers and youngish families, all pretty unashamedly shedding the usual courtesies (here I do mean the passengers more than the staff, who were fine) and unzipping that myth about Brits queuing beautifully. The head stewardbloke – who may in truth have been directing the frenetic activity around him from a position of some Eckle(s)burgian insight – was actually genuinely good value as local prompter and wit, as well as accommodating er …host. However the incoming flight had been slightly late, meaning an almost worryingly quick turnaround – raising certain perfectly legitimate questions. Like would the pilot need a drink? Or a kip? Would they make sure they had air-in-the-tyres/diesel in the tank/a shammy leather handy to wipe the driver’s window? We were all thinking this, or the aerial equivalent, I know: not just little old ahem plane-phobic me. No the flight was fine but I’m kindof with Dennis Bergkamp on this. And soon enough, as our drive progressed (and my palms aired) there came to pass a seamless and vacation-appropriate gradation into ease. Bidache; Navarrenx; Oloron-Sainte-Marie. The visual momentum built as we went from countryside with a whiff of the special, to full-on gobsmacking, as we slid, in fact, into the Vallee d’Aspe. Now ’twas proper rip-roaring glacial scenery and proper mountains seen very close up, from the laughably tight valley floor. A brief, syrupy downpour and then tunnels into the guts of all this rock; into Spain. We’d slithered south-easterly across France and now we plunged north-south just the few tens of kilometres to Jaca, through the area allegedly dotted with ski-resorts. (They are there – around Candanchu – but they simply weren’t on the mission schedule.) With the east-west grain of the Pyrenees at our backs as we ploughed on, we began to recognise gaps or drops into sleeping but boulder-strewn streams and the shoulders of some of the peaks; all this hauled or sprung from the memories of our previous visit, three years ago. We knew something of this place, ‘course we did. And the names now… Sabinanigo, Huesca, Castiello de Jaca. Familiar but still exotic. Wow. Must walk up there later – remember that next ridge? We walked it. That do-able on a mountain-bike? There followed days of exploring and rediscovering. Trudging then latterly floating up Penä Oroel , part shady yomp, part dreamy alpine meadow, concluding with stunning open views which genuinely (in that inadequate phrase) stirred the soul. Or driving with relentless purpose to blissfully little-known pools – pozas – to launch into deep pockets of sometimes shockingly refreshing mountain water. Then perhaps most memorably of all, trekking the bulk of a day, through, over and onto retreating snowbanks around 6,000 feet, faithfully following cairns in the absence of signage or people, to scale Pico d’Aspe. Looking down on France and the universe and (real) chamois(es?) flitting over the snow. Mix in a dollop of ice-cream or fried squid in the town (Jaca), twenty minutes of Real Sociedad on the telly in the sports bar, plus a mowsie round the cave-cathedral that is San Juan de la Penä… and there you have it – or a flavour of it. Wonderful things and daft things. Like my daughter blowing all her holiday money on riding at Caballos el Pesebre, where instead of Pembrokeshire Nags there were sub-Arabian beauties. Where she cantered round (almost absurdly but beaming) beneath Los brooding but beautiful Pirineos. And I just sat and watched and read further into Homage to Catalonia! I can’t pretend we engaged deeply with either the local social or political milieu. I am aware, for example, of the disaster that is youth unemployment in Spain and have views on that. I know that dangerous wee bit about the Spanish Civil War and have some relevant history; some; enough maybe to feel the nearness of Franco and hear the enduring bitterness towards the Guardia Civil. But we were tourists, staying with a family of (fluent Spanish-speaking) non-natives. So what was it, exactly, that made me fall for Spain? The Pyrenees I find stunning and evocative. I failed, I admit, to entirely separate the view from the heroic defiance, the anarchistic militancy and indeed the sacrifice of the population (as was?) Ground like this is going to foster pride and passion and maybe a little wildness and given the essential local connection between folks and earth through time it makes sense that something preciously approaching a worker’s province could emerge here. I am very close to writing that you can still see that – feel it – the land simply seems worth fighting for. In the 1930’s a truly remarkable revolutionary fire swept through much of Spain and continued to flicker defiantly here, in the forests and the farmsteads. Partly, no doubt, because the geography is with the rebel, the guerrilla, not the government. Partly, I like to think, because the people are big enough, generous enough to battle in order to share. Standing on a peak in Aragon, looking at a land that could not be mastered – not that gorge, not that Alpine slope! – I got sucked into all that… romance. It’s a leap from here/there to the following – that I prefer Spain to France – but I will make it, without, on this occasion accounting for the frisson around the subtext. I’ll simply own up to the preference for (imagined) 20th century Spanish defiance over (imagined) French capitulation; that should do it. There’s a certain deep richness to rural northern Spain which blows me away. Kindof uniquely. There is, in Los Pirineos, this endless slew of mountains, a splendid, inviolable peace; no doubt related to – arising from? – the scope, the scale of the view, the physical realities. But there is something else, beyond, beneath. Even allowing for the fact that I was re-reading Homage to Catalonia at the time of our visit and am therefore likely charged with Engaged Lefty Wistfulness, I will dare to suggest that culture, politics, the mix of daily grind and grand philosophical breach – of war, of war, in fact! – breathes into this. In the wonderful, silent greenness of the slopes and the ochre plain I found something very rich and hearty and intoxicating. And though on returning to the French side I was much taken with St Jean de Luz in particular – Spain does it for me. The French must be bawling. Slumped on the fields of Alsace ou Normande, bitterly weeping out their heartbreak. Gawping in the cafe-bars of Biarritz, over the affaire discombobulatingly cruelle. Who could have foreseen it; the day when the English – Les Anglais! – usurped them as the great enigma of 6 Nations rugby? When the lily-whites, the ros-bifs actually actually appeared more difficult to read than the magnificently, enigmatically opaque Bleus. When England from 9 to 15 were that ludicrously French phenomenon, the Unlikely Lads. Or worse- the Unknowably Untested Lads. Or the Godknows What Will Happen Lads. But such is the current, anti-intuitive scenario. For the arrival of Philippe Saint Andre – and his selection of a 30 hommes squad – seems to have been relatively quietly appreciated and indeed commented upon in rugbygossville. Notable picks are Beauxis, the Toulouse pivot and the returning Poitrenaud and Nyanga. Elsewhere the Yachvilis and Parras and Vincent Clercs give the thing a spookily familiar, if not (ever?) trusty look. But when this is a side that recently featured in the World Cup Final, why wouldn’t it look familiar? What’s to be gained by too much faffing, now the Fiddle-Meister-in-Chief Lievremont has disparu? The fact that his charges were possibly the most unlikely and almost unbelievably ungraceful (and therefore unpopular) French side in memory that somehow woke up to find themselves in a WCF is interesting rather than seminal. They were actually shambolically crap; but they almost made it. Like France would. Now they must add structure and consistency to the engagingly, maddeningly French stuff. So there won’t be too many changes; unless Saint Andre can fashion some conviction and some unity; in which case they might win the thing at a canter. Scotland have surely no chance of winning the tournament. Certainly not with just the two home games – England and France? Their contribution to and competitive streak in the tournament is, to their credit, gathering but the retirement of Paterson leaves them further adrift in the putting points on the board stakes, does it not? For all the recent highs – the heartening resurgence vol. XXlV – it just appears that that minor detail (execution from the backs) eludes them. I do not discount the achievements of either Edinburgh – sitting pretty ‘midst the Heineken Cup Quarters elite – or Glasgee – sitting pretty pretty in the pro12 – but who amongst the back division is actually going to score? Ross Ford is a mighty and a proud wee leader of men I’ve no doubt, and the famed back row in particular may yet marmalise (in particular) the soft centre of their first, momentarily white-suited opponents. But the quality they have at 9 and 10 is rarely matched outside. Consequently the Cussiter/Blair/Parks axis either has to really make something very new happen, or energise the loose forwards towards more than the occasional or moral victory. Andy Robinson – a man treated poorly I suspect by both players and officials at Twickers – knows all this and is no doubt icily smouldering for a win against the English first up. That’s certainly do-able. Given the genuine all-court progress Robinson has led, plus the inevitable key Mel Gibsonian roar of the sporran-touting masses, Messrs Hodgson/Farrell and co might be forgiven for pooping their Calvin Klein’s at the prospect. The Scots may not need any backs to win that one; which may be just as well. Paterson is scheduled to take a fond adieu in one of those cringingly orchestrated ‘farewells’ that pro sport does these days; before kick-off; against the English. He, like us, just won’t know which way that one will go. The Italians, under new coach Jacques Brunel mirror some of Scotland’s shortcomings, only maybe in a hall-of-mirrors kindofaway. They are at times, more weirdly inadequate, especially as they approach the opposition 22. If they ever do. Cruel? Perhaps. But the Azurri, who battle bravely and with some efficiency at scrum and at breakdown – where the likes of Castrogioavanni and Parisse and to a lesser extent Bergamasco deny smug notions that they are there to make up the numbers – are… short of numbers. Numbers 10 to 15 typically. And maybe 4, 5, 6. Ish. Consequently, the feeling and the likelihood remains that they can’t quite compete. Not in more than one or two games. Not really. There have been times when those of us who love the game and rate the Italian zest for it have chorused endlessly on the subject of kickers. The lack of which has been absolutely key to preventing the Roman hordes from further, more rewarding pillage. (Remember they did beat the French in Rome last time out.) The chronic shortage of place-kickers in particular has de-empired them before the legions have been dispatched. I have myself, on many occasions, volunteered to step up at time of need, having struck successfully for Italia on many occasions – I kid you not – in the Thunder Bay and District Midwinter Soccer League. (‘Nother story- let’s leave it.) I wouldn’t, believe me, have missed. Not like that. Now, again, the question may be How To Stay In Touch with those who are just that bit better, that bit more likely to ‘execute’. Whilst watching another convincing flurry from scrum to about halfway, I, for one, will be wishing our Italian brothers well.